Hiring a Marketer? Join the Crowd! Great news for job-seeking marketers is on the horizon. The August 2017 CMO Survey found that companies will hire 6.4% more marketers in the next year, representing a 72% increase from the February 2017 report of 3.7% change. This current rate is also higher than the 5.2% average percentage change reported since February 2012. 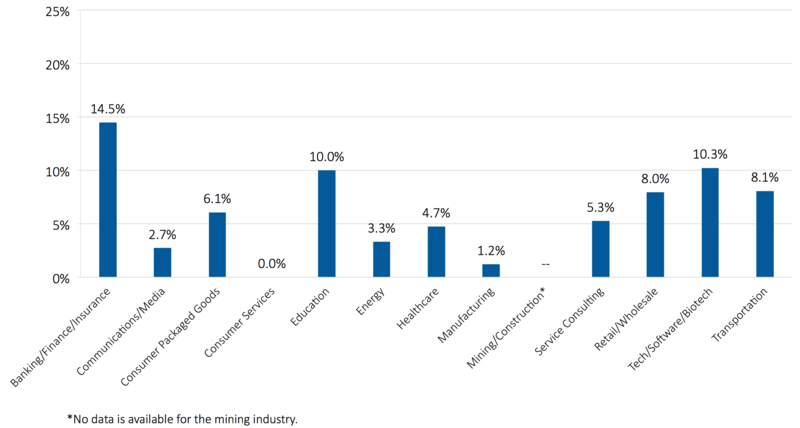 As shown in the Figure, the sectors that plan hiring above the 6.4% average are: Banking/Finance/Insurance, Tech/Software/Biotech, Education, Transportation, and Retail/Wholesale. Other data from The CMO Survey confirm that the two industries leading in anticipated marketer hiring—Banking/Finance/Insurance (14.5%) and Tech/Software/Biotech (10.3%)—also expect the largest increases in marketing spending in the next year. So what is happening in these two sectors that produces the need for more marketers? Here are a few theories. First, considering Banking/Finance/Insurance (referred to as Financial Services throughout the rest of this blog), one theory is that the sector is experiencing increased competition for customers. As Rain Newton-Smith, Director of Economics for the Confederation of British Industry noted in the Telegraph, “Looking ahead financial services businesses are planning to ramp up their marketing spend to try to reach new customers, as competition from new entrants and from other sectors intensifies.” I expect the same trends are occurring in the U.S. Financial Services sector. Another theory as to why the Technology and Financial Services industries are experiencing marketing job opportunities is the emergence of fintech—the use of technology to offer novel financial services to the marketplace. Fintech has historically been driven by startups that identify gaps in traditional banks’ offerings and jump in to meet unmet needs. Popular fintech companies include Quicken Loans’ Rocket Mortgage, Venmo, TransferWise, and Robo-Advisors, all of which have rattled the industry with innovative online tools. These companies are part of the competitive threat previously noted. More established companies are responding with innovations of their own and need marketing help to understand emerging opportunities and to serve customers faster, easier, and with greater security. The rise of fintech and the need for marketing innovations in the financial services sector can also attributed to a desire to capture millennials’ business and trust—the third theory to explain marketing hiring. Millennials not only have massive buying power, but also a huge appetite for online relationships with companies and prefer to use their smartphones and laptops for all of their banking, finance, and insurance needs. These historically high-touch activities need to be rethought from the perspective of millennials’ different requirements and behaviors. Marketers may be in the best position to offer companies these insights. Considering tech industries more generally, a final theory is that tech is still making up ground for being product-centric for so many decades. I interviewed Ed Bernier, Director of Daytime MBA Career Services at Duke University’s Fuqua School of Business, who noted that “Industries outside of CPG are playing catch up in realizing the value of having a strong competency in a science that can identify and deliver value to their consumers: marketing.” The August 2017 CMO Survey data confirm Bernier’s belief that more industries are recognizing the necessity to possess robust marketing capabilities. Whatever the theory, the data from the August 2017 CMO Survey predict a strong future for marketers as diverse industries seek to identify opportunities and ways to serve customers better. Click here to see if you qualify to participate in the next survey and for all three CMO Survey reports.